MEXICO CITY – In an unusual twist to a continuing struggle over workers’ rights and “free trade,” the Service Employees and a top Mexican employment lawyers group are using the pro-worker side letter – weak as it is – of the controversial North American Free Trade Agreement to go after Alabama’s anti-immigrant law. 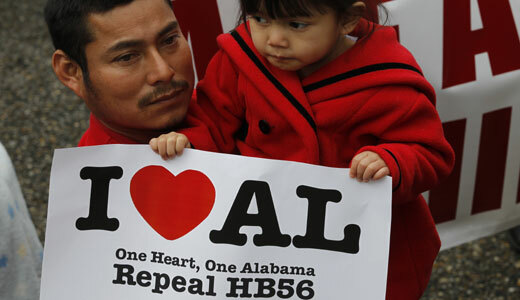 Their target: To force the U.S. government to take strong action against Alabama’s racist, anti-immigrant law, HB56. The union and lawyers are submitting evidence to show it violates NAFTA, and they’re asking Mexico’s Labor Department to open talks with the U.S. government on solving the problem. “Alabama has adopted legislation that violates human rights and labor rights of migrant workers and contradicts key provisions of the North American Agreement on Labor Cooperation [the labor side agreement to NAFTA],” says the complaint, filed in Mexico City by Enrique Larios, president of Mexico’s National Association of Democratic Lawyers, SEIU President Mary Kay Henry, and Secretary-Treasurer Eliseo Medina. The constitutionality of the Arizona law is currently pending before the U.S. Supreme Court, though the complaint about Alabama, filed two days after the justices heard the Arizona case, did not mention that. The Mexican government has filed friend-of-the-court briefs in U.S. lower courts against both the Arizona and Alabama laws. “The U.S. is failing to effectively enforce labor and employment laws to halt or mitigate the effects of these abusive state laws,” the lawyers and SEIU told Claudia Anel Valencia Carmona, the Mexican Labor Department International Affairs Director. Her office handles the NAFTA complaints. 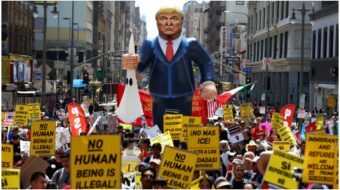 “The U.S. has not acted effectively to assert federal power to stop the states’ anti-immigrant legislation and halt labor rights abuses. 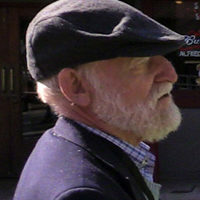 Legal ambiguity abounds and lawsuits have resulted in a hodge-podge of partial injunctions, with many abusive provisions left standing,” they added. All this violates the NAALC and NAFTA, the complaint says. It asks the Mexican agency to demand talks with DOL to solve the mess. And it wants Mexico to appoint an independent expert to probe Alabama, collect evidence and recommend solutions. In their own letter to the Mexican Labor Department, Medina and Henry summarized many of the complaint’s points about how workers are harmed. “HB56 contravenes the NAALC labor principles by creating a climate of fear and intimidation that chills immigrant workers and their co-workers who seek to form trade unions, bargain collectively or participate in other worker advocacy organizations,” the two SEIU leaders wrote. 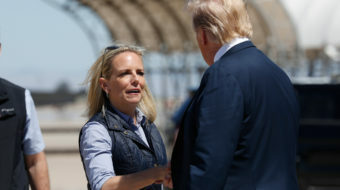 Though Medina and Henry did not say so, thousands of Hispanic-named people – documented immigrants, undocumented immigrants and native-born citizens with Hispanic names – have fled Alabama to escape suspicion, arrest and deportation. Children have been yanked from schools, as Alabama turns principals into enforcers asking kids about their, and their parents’, status. Families have been split up. The Alabama law goes beyond other similar laws in other states, by criminalizing anyone who helps an undocumented worker, even inadvertently. It also bars anyone without documents from university enrollment, bars enforcement of contracts with them – which the complaint says could let employers get away with not paying workers – and even bars firms from deducting wages paid to undocumented workers from employers’ taxes as expenses.